It is in this northern part of the island that Madagascar has its smallest breadth, resulting in a high concentration of poles of interest. It is not hazardous to assert that the Coast of the Virgin Islands of which it is part owns among the most beautiful sites of the country. This region, which has long been a land-locked area, responds to the sweet name of Diana (acronym Diego, Ambilobe, Nosy Be, Ambanja) has always felt the call of the open sea.. 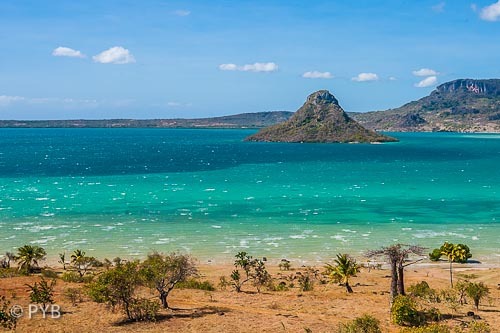 The seaside dominance of its tourism is very marked, but it is also here that one of the best assets of the destination Madagascar stands out: the alliance of a remarkable marine environment with a terrestrial environment and a biodiversity often exceptional. Diego Suarez, a town full of history where Yemenis, Somalis, Comorians, Arabs, Chinese, Indian, Pakistani and European cohabit with the Malagasy populations, mostly antakarana and sakalava. Colonial architecture is still very present. From the place Joffre where our day ends we enjoy a breathtaking view on the third port of Madagascar. It is at this moment that the Diego by Night starts with its tastings of skewers on the sidewalks. Many restaurants, bars and nightclubs are there to liven up the atmosphere typical of the city sometimes until the end of the night. Departure towards the South by this newly redone road that allows to reach the capital. After having branched off towards Joffreville, a small village of Creole architecture resembling its neighbors to the highlands of Reunion island, we visit La Montagne d'Ambre, the first National Park instituted in Madagascar in 1958. Culminating at 0,91 mi altitude, we observe waterfalls, lakes, and lush vegetation due to exceptional rainfall. Farther on we meet by a track not always practicable the “Red Tsingy”, a wonder of nature. These cathedrals, consisting of sandstone, marl and limestone, are the result of erosion. The spectacle of these pink Tsingy erected at the bottom of a canyon is simply magical. Before joining Ambilobe, we stop at the Ankarana Reserve. A very rich fauna allows us to observe some species of lemurs like Lemur Coronatus, Lemur Fulvus, Lepilemur and Hapalemur. Tsingy eroded by rain and water sculpting horizontal and vertical fissures give the impression of an immense scree, all in the middle of a luxuriant vegetation. We take the direction of Ambanja by a beautiful road lined with meadows or cultures of ylang-ylang, pepper, coffee, vanilla and cocoa typical of this region enjoying a permanent microclimate and a rainy night . It is from Ankify, a small fishing village that leave the vessels that connect the "Big Island" to Nosy Be. Many boats and ferries regularly carry passengers, refueling and automobiles. We discover of course the many neighboring islands, small plots of paradise with their beaches of white sand. Nosy Komba, the lemur island, is the largest with a summit culminating at 2.200 ft. There is one of the oldest plantations of ylang-ylang, pepper and vanilla. In the village of Ampangorina the tourist activity is intense. Local guides take us to see the Lemur Macaco, chameleons, turtles, snakes, crafts on wood and the famous embroidered tablecloths, typical of the region. We take the sea again to Nosy Tanikely (the small land), islet became a marine reserve, to discover a beautiful aquatic fauna. Picnic, swimming and relaxing before returning to the port of Hellville, the capital of Nosy Be (the great island). Hellville, capitale of Nosy Be has only one main street but it is very animated. Colonial architecture from the beginning of the century, covered market, numerous shops and restaurants. In April the Festival "Donia" brings together the greatest artists of tropical music of the Indian Ocean. We take the road to the north and Djamanjary, where we discover an old sugar factory and a vintage railway network that was used to transport sugarcane. It was there that was made until a few years ago, one of the most popular rums of Madagascar. In Ambarao, a canoe takes us in a few minutes to Nosy Sakatia (the island of orchids). A subtle blend of sand, rocks and coral under crystal clear waters, mingled with lush vegetation, makes it a tropical dream setting. In Ambohibe south of the island culminating at 450 ft, live the “fanihy”, giant bats as well as the smallest chameleon in the world measuring not more than one centimeter, paradox of nature. Farther north along the coast and after crossing many villages with flower gardens, we branch off on a trail that leads to the Mont Passot. From its height of 1.080 ft, it offers a panorama from the coast to the ancient volcanic craters which have become lakes today. We continue to the beach of Andilana, one of the most beautiful and largest of the island. The low tide reveals its immense sandbanks. It is here that we take the boat to cross the bay of Befotaka. We stop at Nosy Fanihy, the holy island. A deserted and sacred islet sheltering the burials of princes Sakalava of the region. Only the waves that run aground on an immense bank of sand and corals come to disturb the terns come to seek here as us a little tranquility. Within a radius that one could - very arbitrarily! - locate between Nosy Lava the northernmost of the Mitsio and the Radama islands in the south, the northwest coast lends itself to Sailing and marine excursions in ideal conditions practically all year round, with perhaps a small exception for the months of February and March. Protected from the big swell by the Grande Terre, the sea is beautiful and the navigation is done by the thermal winds. Great Mitsio, Nosy Iranja, Ankarea, the Four Brothers, Tsarabanjina the island-hotel ... several days can suffer enough to relax from one island to another in the Mitsio Archipelago on background of diving, fishing, And bivouac. Among Nosy Be's immediate satellite islands and its crater site which gives it its distinctive character, Nosy Tanikely has an exceptional marine fauna and its funds are classified as reserve. For the small history the island has only one inhabitant, Omar, former keeper of lighthouse. This modern-day Robinson welcomes tourists, sells crafts made by his wife, and apparently has no time to get bored on his island paradise. Nosy Komba the island of the Lemurs is also a place of adoration of the ancient sovereigns, and the tourists can leave with the superb embroideries proposed by the villagers. Nosy Iranja Is the preferred place of sea turtles to lay their eggs while Nosy Sakatia is the local area ideal for sport fishing. Those who want to go even further will not be short of combinations to compose their itinerary. The choice is vast, including Nosy Mamoko and its fishing village, Kisimany with miniature Amazonian airs, the Baie des Russes, the Radama islands and their emerald waters. The cruise then acquires an equally interesting parallel dimension, that of a journey to the heart of the immemorial sakalava traditions.